Geoffrey Parker es una joya entre los hispanistas. No tardarán en darle el premio Princesa de Asturias. Aunque, como todos los hispanistas británicos, su visión suele ser parcial en lo que respecta al papel de Inglaterra en los siglos XVI y XVII. Significant battles and political movements. Religious strife and great powers being sucked in with no exit plan. Players rise and fall from defeat, death, or both. The fighting continued until the financial deadlock struck them all. The Thirty Years was lays the groundwork for understanding Europe prior to the Napoleonic Era. This book is a great overview (I stress overview) of the climactic struggle known as the Thirty Years War. While lacking in detail, the book does a fairly good job of discussing the high points and the significant players. Very little discussion is spent on those nations that had very little (my opinion) to do with the struggle (England and the Ottoman Empire). Yet during some of the discussions, the book went into a very detailed description to back up the text. The mixture of high level discussion with a sprinkling of extensive detail was a bit confusing but welcome. Overall, I gave the read four stars and recommend this book as a starter for understanding of the Thirty Years War. La Guerra de los Treinta Años es un conflicto que ha aparecido tangencialmente en varias de mis lecturas históricas pero del que desconocía practicamente todo. Y después de leer este libro veo que me estaba perdiendo mucho: un enfrentamiento que empezó siendo puramente alemán para evolucionar en una guerra que afectó a casi todas las naciones europeas de la época. Una guerra terrible, donde no era raro que príncipes y estados cambiaran de bando y en el que las victorias de un año no garantizaban que el ser derrotado casi totalmente al siguiente. Todo ello en medio de una devastación sin precendentes en Europa.El libro comienza confesando su incapacidad de tratar en profundidad un conflicto tan vasto, y es cierto que en ocasiones se hecha de menos que se ahonde más en algunas partes de la contienda, así como su influencia en el resto de países (por ejemplo, la desaparición del "camino español"). Pero como visión general me ha resultado muy ameno e interesante, dejándome con ganas de saber más. La Guerra de los Treinta Años fue el gran conflicto del siglo XVII. Geoffrey Parker estudia el conflicto desde la génesis y el problema religioso inicial, la relación del Emperador y las interferencias de las potencias como España, Suecia o Francia. Bien documentado, escrito de forma amena pero no por ello sin rigor histórico. Una obra recomendable. It is very hard to write about the Thirty Years War in a way conducive to entrance a modern reader who is not a specialist. This is for obvious reasons - the conflict spanned, yes, 30 years, and the seeds for the conflict go back deep into the 16th century. The number of players (monarchs, "prime ministers", generals) is large and they often have the same names. You need a reasonable understanding of central European geography so you can fix in place where Styria is in relationshp to Bohemia, or Hesse-Kassel in relationship to Mecklenberg without frequent resorting to maps.So, why the renewed interest? Well, many commentators have pointed out that Europe resolved its religious conflict during the Thirty Years War whereas the modern Arab world still fights a centuries old Shia - Sunni doctrinal dispute. So, it might be nice to understand more about the details of how Europe broke out of its confessional animus.So, why Parker's book?I have several books on The Thirty Years War"The Thirty Years War" by Peter Wilson (the most recently written)"The Thirty Years War" by Herbert Langer (translated from the German)"Battles of the Thirty Years War" by William Gutrieand many years ago I read "The Thirty Years War" by C.V. Wedgewood.Wilson's book is massive and the pace moves too slowly - many many pages are written on the succession crisis in the duchy of Jülich-Cleves, one of the matches that set off the Thirty Years War. Who (at least an American) even knows where Jülich-Cleves is? Anyway, after wading through 100+ pages before anyone even got defenestrated, my eyes could not go on. 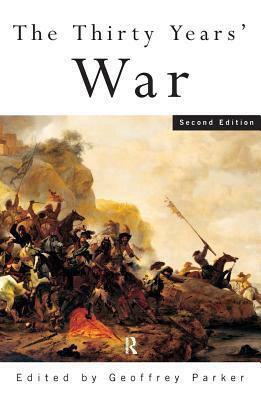 So, I switched to Parker as he covered the Thirty Years War in <225 pages. Parker is polyglot (essential to reading the source documents) and had contributors who aided him on subjects where he wasn't conversant with the language (the Danish intervention for example).So, what do you get?A reasonably readable account of the conditions leading to the war (many characters who come and go and the doctrinal disputes between Lutherans, Calvinists, and Catholics although crystal clear to the participants of the time, are somewhat less clear today to any reader not well-versed in theology (like me). Parker then breaks the war down into its phases, generally the 1620s, the 1630s, and then the 1640s. Then, there is a wrap up chapter on the war's effect on society and culture with a bit on the military revolution.Because the war lasted so long, and the politics were complicated, and the book is only 225 pages long, Parker opts not to give much color to any of the leaders. This is not a book where one can learn much of anything about the personal lives, peccadilloes, or even appearances of the Electors, Kings, Emperors, or cunning counselors. The book does not even come close to pretending to be a pot boiler. Landscapes are not luridly described, battles are mere sentences, and human tragedy is scarcely mentioned (e.g. Sack of Madgeburg). It is not a military history book.One has a hard time putting oneself in place at the time, what life was like for the peasantry, the merchants, or even the court. Key figures like Wallenstein are barely fleshed out. The book is not history written for the lay reader 'a la Stephen Ambrose or Erik Larson. Instead, it is a survey of a complicated set of politics and how those political aims were achieved (or not) via military means. Economics clearly had an influence as countries bankrupted themselves financing armies thus forcing alliances in order to stay afloat.At the end, the reader gets a good sense that state political aims won out over merely confessional labels. The modern nation state began to arise. One also gets an excellent discussion of sources for further exploration. The maps were usable and helped place principalities, regions, towns and battles in geographic relationship to each other. There are some interesting plates of important contemporary documents and images. But, for my money, if you want a book length treatment of the Thirty Years War, this is the best I've seen. The Thirty Years' War is an immensely complex subject. Not only does it take place over a long period of time, but the issues that resulted in, and then carried the conflict to its conclusion, are labyrinthine, to say the least. Additionally, the personalities of the war change frequently, as almost all of the major figures present at the beginning of the war were dead by the end, and even the combatants changed from year to year.That said, this book did very little to increase my understanding of the conflict. The prose is nothing special, but it's also not very illuminating. Occasionally, sentences followed seemingly unrelated sentences. I was baffled. Additionally, the compact text goes into heavy detail in some issues, yet leaves others barely resolved. I felt lost a lot of the time. Tras leer el libro me queda la impresión de que en ésta guerra comenzó dilucidándose si el Imperio sería católico o protestante y terminó decidiéndose qué potencias dominarían Europa en el siglo siguiente. España, que entró en el conflicto apoyando al emperador, acabó derrotada por Francia y los Países Bajos, sufriendo revueltas en Cataluña y Portugal, y diplomáticamente aislada de los Habsburgo austríacos. Fue el inicio del declive de la potencia ibérica. My colleague said it best: "It's like reading a 200 page encyclopedia entry." Parker's book is a detail-heavy political history. Though he does his best to outline this complicated European conflict, it's not without problems; I was especially bothered by the jumpy chronology. The Wikipedia page is a fine substitute for this book, though I would recommend the last chapter of Parker's book, which does have an interesting argument about why the conflict endured as long as it did. Great detail about the maneuverings of the politicians and nations leading up and through the war. Not a lot of detail until the final 30 pages on the impact, what it was like for civilians, specific anecdotes of warfare and all the tidbits that would make this book interesting. I'm sure there's better books about the Thirty Years' War. Nicely readable overview of the depth and scope of the Thirty Years War. Heavy on the military history, naturally enough, but covered the major and many minor players well enough along with the shifting alliances and boundaries that were being fought over. Land, politics and religion, what else is there? Not a fascinating, draw-you-in, kind of book. Now that doesn't sound like a ringing endorsement, does it? But I really did enjoy it. The topic is very complicated and seemed so at first, but it became much clearer as the book progressed. This is a decent introductory book on the war. Because it's not a overly large book, it doesn't cover anything in a lot of detail. It suffers from only having 3 strategic level maps and they hardly show that many locations. This is one of the better histories of the great religious war in Europe during the 17th century. A very god History book, even considering that it is concentrated in a short historical period. It covers the material, but it is very dry and long to read. Gateway to understanding the history of modern europe. This is an overview of a hugely complex topic but a very good place to start.